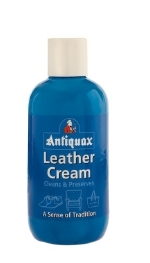 Once clean, protect and feed your leather with Antiquax Leather Cream. The oils in Leather Cream feed the grain keeping the fibres supple and restoring the natural oils lost due to the drying effects of central heating and exposure to sunlight. Leather Cream is suitable for antique and modern leather. Clean all your leather with this leather soap. Work the Leather Soap into a lather and apply with a damp cloth or sponge. Ingrained dirt and grease will be gently removed leaving a clean finish. Leather Soap is available in two sizes.